The widow of a cruise ship passenger who died when it was hit by a wave in the English Channel has criticized the vessel as “badly maintained”. James Swinstead, 85, of Colchester, Essex, was killed when a huge wave crashed into British cruise ship Marco Polo during severe storms on Friday. His widow Helen praised the crew the Cruise operator Cruise and Maritime Voyages (CMV) said it did not want to comment on Mrs Swinstead’s remarks. 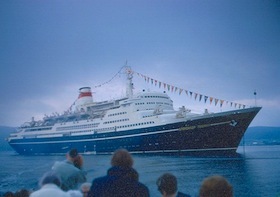 The Aleksandr Pushkin (the current Marco Polo) entered service in 1965 with the Baltic Shipping Company, one of the three principal Soviet passenger shipping companies (the other two being the Black Sea Shipping Company and the Far Eastern Shipping Company). Reports about her service in the Soviet fleet are fragmentary and conflicting. Most sources state she was used to inaugurate the Baltic Shipping Company’s regular trans-Atlantic service between Montreal, Canada and Leningrad, and later on used for cruising. During the late 1970s the ship sailed from New Orleans to Havana… but attacked the state of the ship. The 22,000-tonne vessel was heading for its home port of Tilbury in Essex at the end of a 42-night voyage when Mr Swinstead died. Water crashed through a window, injuring a number of the 735 passengers, who were mainly British. Speaking in Tilbury after the Marco Polo docked, Mrs Swinstead said: “I think it killed him almost instantly. “The ship was badly maintained. Four windows blew. “I said to my husband, because my father used to make paint, that’s going to leak because there was a rusty puddle on the window sill. “I expect to hear from the Marco Polo. He was a lovely husband. “The crew have been fantastic. I think the ship is improperly maintained. It had come from Madeira before we got on it in January and they had bad storms then. “There’s so much paint on the outside you can’t see the rust, they just slop some more on when they get to port. Another passenger Linda Kogan said: “It was horrendous, I’ve never been in storms like it. The waves were coming up almost over the ship. “The ship was at an angle. Some people reported the drawers were falling apart and the wardrobe doors falling off. “A lady was actually thrown out of bed with the force. We weren’t in the restaurant when the windows broke but I think it was really scary. “One lady said it was just like the films with the foamy water and being swept across the restaurant. The wave caused damage to the ship’s Waldorf Restaurant. The vessel, which has been to the Amazon in South America and to the West Indies, arrived back at Tilbury late on Saturday night. 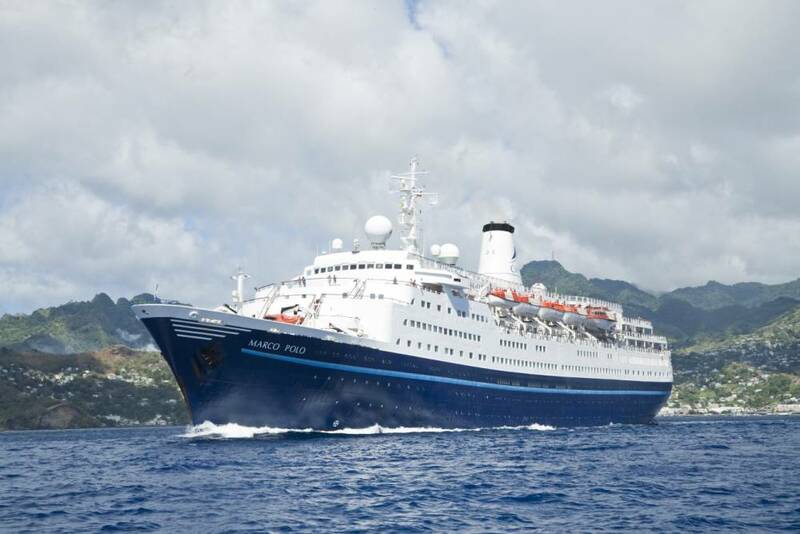 Following repair work, the Marco Polo is due to set sail on Sunday evening from Tilbury on a 14-night cruise to Norway. The Marco Polo regularly offers cruises from Tilbury, London, and is operated by UK-based Cruise & Maritime Voyages. She is a smaller ‘Ocean Liner’ from a bygone era. A 15 night Christmas and New Year cruise to Maderia on board the Marco Polo interested us: formal evenings, socialising, playing bridge, attending lectures, good itinerary, plenty of excursions – lets go for it. “Agreed it’s a small ship but a decent cabin on a convenient deck should suit a couple in their 80s – everything to hand.” proferred the agent. So we paid a sizable sum and awaited the sunshine. Our first impressions on boarding were mixed. The ship was obviously limited but the cabin was ok (except the windows leaked). We cherished our steward in the days to come. Dining presented a problem; very cramped and the food was ‘fiction’. A seven course menu might contain something you can eat – warm tasteless soup, a weird mash of fish, tough meat, risotto resembling cold porridge or a reliable salad and ice cream which we survived on. Don’t ask about Christmas day, it was a disaster. Chunks of turkey, uncooked sausage, raw bacon and mashed vegetables – no sauce or gravy. Christmas pudding, pies and strudels all contained the same cold mixture, waiters struggled and so did the passengers. The Buffet housed chipped mugs from which we dangled our tea bags and the food was even more dubious so we seldom visited. When the restaurant and Buffet were rendered out of commision due to storms we enjoyed the delights of free mini rolls containing breakfast sausage kindly delivered to our cabin by the stewards “Sorry no hot drinks – £2.20 for a bottle of water”.The next 8 hours were painful. Our first 4 days at sea ruled out making Gibraltar. Confined to our cabin due to force 10 gales and mountainous seas it was unsafe to attempt passageways and stairs as the lift were out of action. Fitments and wardrobes decanted our possessions, bottles and glasses smashed and i was nursing a bang on the head for days when i collided with the toilet door. Sadly, the medical centre already had 17 patients with broken limbs and more. Eventually some were flown back to the UK. Daily apologies greated us on the tannoy – Lanzarote was out, due to schedules, but we would make Sante Cruise Pala. Pity the coaches broke down and the tourists’ suffered. Tenerife was anxiously awaited since more passengers left for home. Maderia was the long awaited highlight. If you booked a tour surely you would expect to disembark first and leisurely join the party at the appointed hour. But no, not on the Marco Polo. Some waited until the last tender pulled alongside and by then, red faced, and full of apologies they met the coach 45 minutes late. Obviously we didn’t get to see everything and missed the opportunity of linking up with friends at Reids; we had come a long way. From then on we motored for another 4 days at sea. Coupled with a titanic slide of chairs i also injured a knee, another man broke his shoulder. Lisbon/Oporto were cancelled but why hole up in Le Havre, a boring shipping port, for a day in order to carry out repairs and a quick make over. In truth, the vessel had to leave Tilbury for South America the next day, God help the passengers. The concessionary payments were offered: £25 each and 20% off your next cruise. There weren’t many smiling faces when we disembarked. Injuries aside it was a good way to diet. we both lost 5lbs. Disaster, just a disaster.